Wow. A lot going on since I’ve checked in here. There is never enough time to do the things we want to do. NEVER. So we (each of us) do what we decide, or feel we must, or chose to do. (or is it choose?) No matter, my friends know what I mean. Here are a few nuggets. I have been doing a little salmon fishing. I have caught an occasional salmon. some days. I have failed to catch salmon some days. This has been generally a very slow year, with fair numbers of early fish showing but apparently few as the season progressed. Salmon fishing on the central and northern Oregon Coast is going to be curtailed in the next few days with closures in upper tidewater, the rivers, plus a daily one fish and season remainder three salmon retention limit. I support the fishery curtailment. I have been building my Youtube Channel and now have some 74 videos posted. You can find my channel by going first to youtube then searching Jay Nicholas. I had to laugh at the demographic analysis of my viewers: 100% males over 65 years old. I hope that this is not a complete picture of people looking at my videos, but if so I hope they enjoy the material. I have been having GREAT FUN tying pike and musky flies. 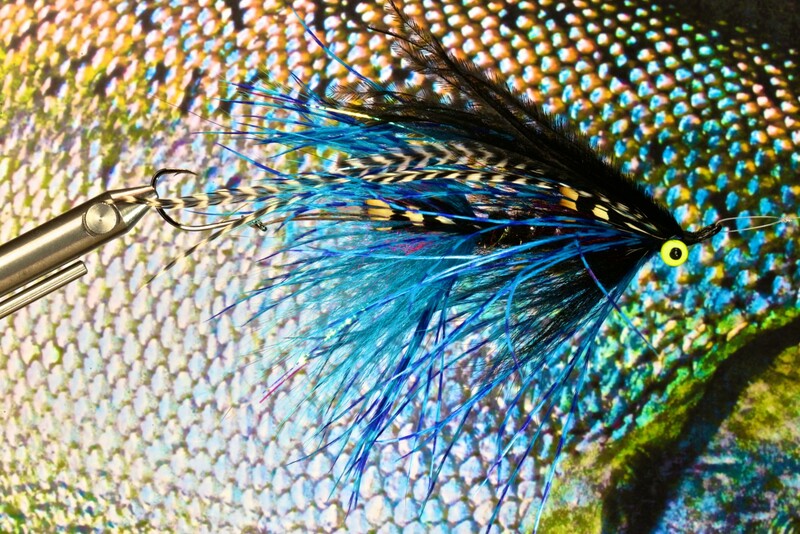 There is scant chance that I will ever be able to fish these but I consider this as part of the art and creativity of fly tying. The same is true regarding flies tied hollow style. I am particularly engaged in tyng large streamer style flies using long saddles and hollow-style bucktail. I experienced two very fun albacore tuna trips this season, the first with my friend Kevin and the second with my friends Ed and Rob. The ocean salmon season offshore Pacific City was better than any I’ve seen since I think something like the last five years. There was an abundance of big (8-10″) squid in the ocean quite near the surface and within a mile of the beach. The salmon were feeding on the squid and our bucktail flies, including silvers and kings. The chinook we caught seemed to be destined for the Columbia. This is guess based on the fact that they had rather pale orange flesh rather than deep red-orange flesh like I would expect from Nestucca fall chinook in the ocean. The pale orange flesh is probably an indication that these are Columbia River TULE stock. My family and friends are well and good. Family cats Gracie and ‘Boomer are well. Salmon Fisher’s Journal is delayed again but still plugging along. I can no longer leave fly rods on the bench in front of our family cabin. Fly lines are not save now, apparently. I have so many projects in the works (thinking stages) that I can’t wait to get going. Videos. Flies. More Books. Thank you for your patience, good wishes, and support. Cabin Kitty enjoys a fly line for lunch. Indeed. The sweet little cat ate my SA Type I shooting head. #20: did a little cat carry the pots away? Thanks for the update Jay. I got a story published. Hope you like it. January edition of American Angler magazine. Thanks for your support and the materials you sent. 24 year old checking in here. Love the videos. Hopefully that doesn’t sway the youtube demographic too much!